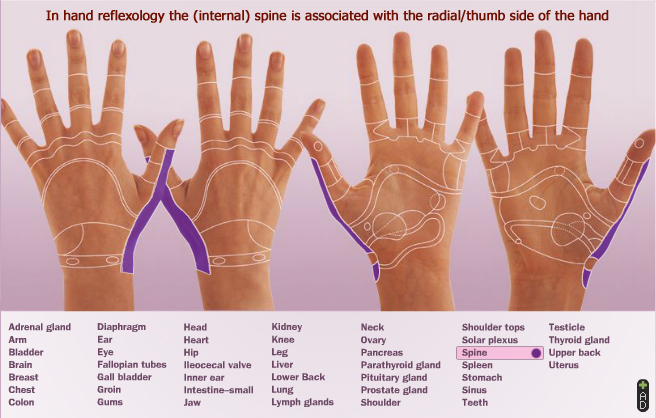 Hand Reflexology: spine corresponds with radial thumb, extremities with ulnar hand! Hand reflexology: the warm internal spine corresponds with (radial) thumb; colder external extremities correspond with ulnar side of the hand! Western hand reflexology charts usually point out that the thumb (located at the radial side of the hand) gets associated with the internal spine, and the ulnar side of the hand usually gets associated with the extremities (arms + legs) plus other the most externalized body parts such as the ears. Body temperature explains some part the logics behind these associations! Thermography pictures for the human hand usually demonstrate that body temperature in the fingers is highest in the thumb and lowest in the pinky. 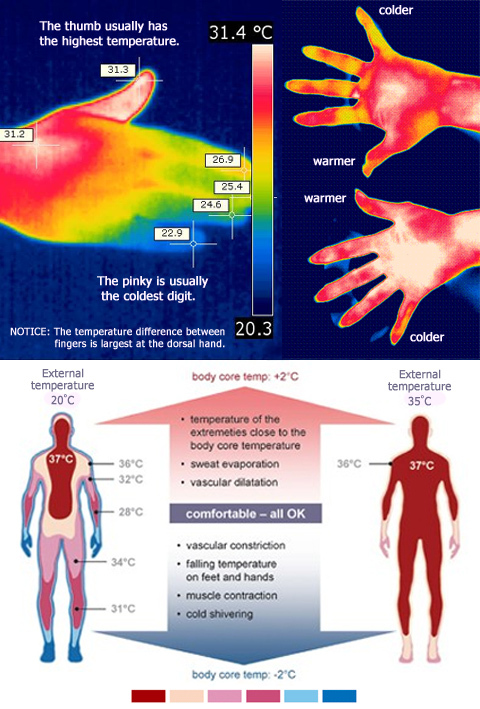 Finger proportions likely explain this temperature distribution, because thermography pictures for the full body show that the highest temperatures inside the full body are usually found at the core of the body - close to the spine which is located at the central axis of the torso (see picture on the right). The parallel between the body temperature distribution inside the hand and the body is an illustration of the anatomic fact that body parts and bones tend to become more narrow and thinner at the extremities of the body. 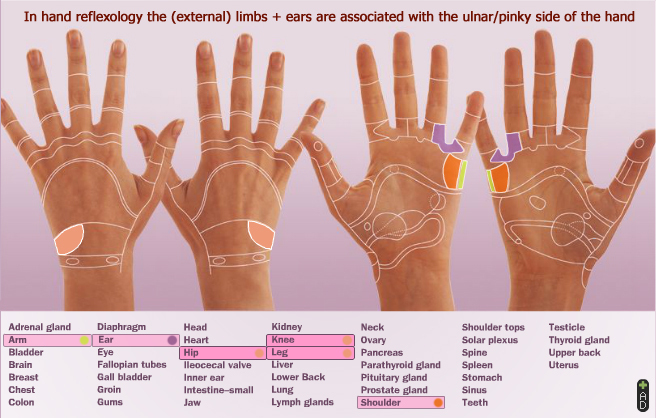 Western hand reflexology charts usually present a map for the human body (in terms of body parts and internal organs), where the thumb gets associates with the internal spine and the pinky finger gets associated with the body extremities (= arms & legs) plus other externalized body parts (such as the ears). Other body parts & organs are mapped between the thumb and the pinky. 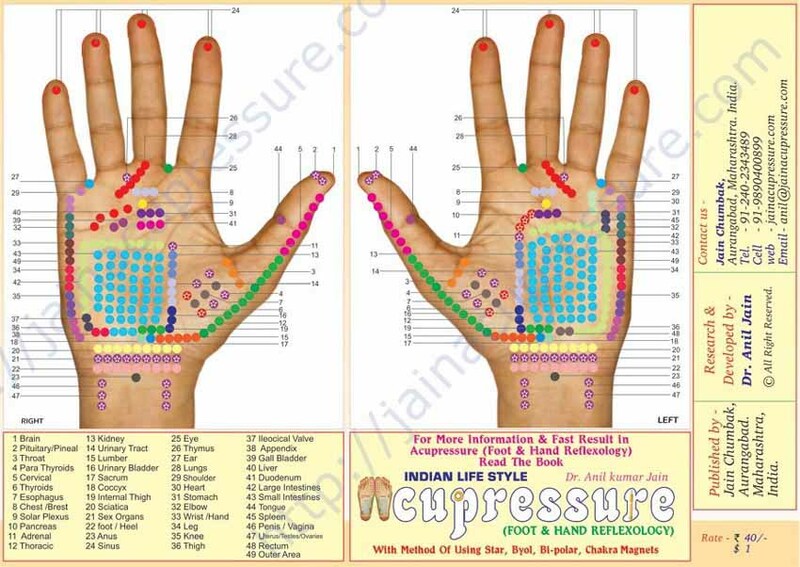 The maps below describe some details as described in the interactive hand reflexology chart presented by Kevin & Barbara Kunz. 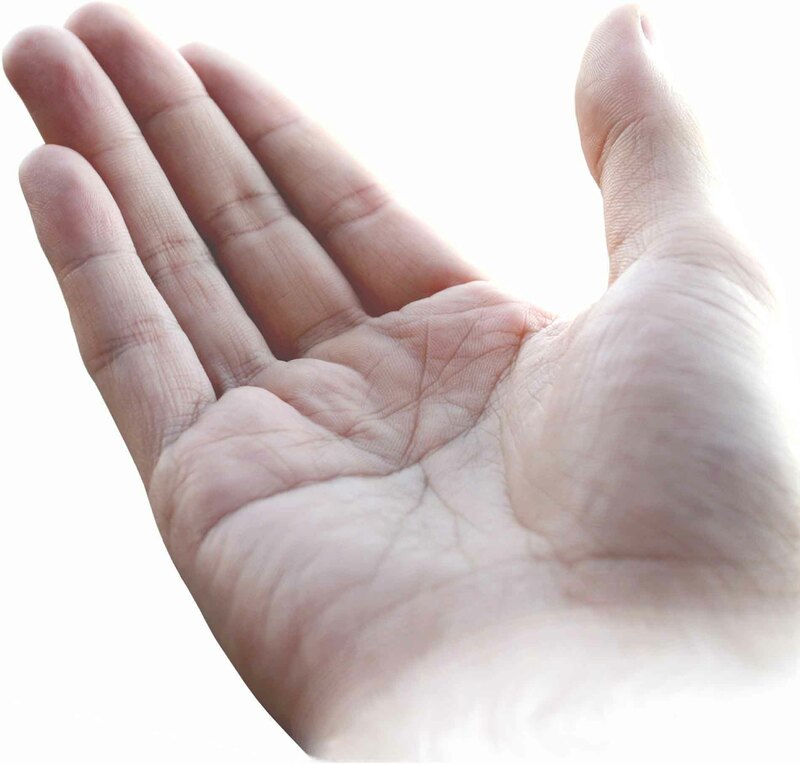 Hand temperature distribution: thumbs have the highest temperature. The upper chart below displays how according the Kunz hand chart the spine (= the most internalized body part) gets associated with the thumb or first digit at the radial side of the hand; the next chart displays how the more externalized body parts (including the arms, legs & ears) get associated with the pinky finger or 5th digit at the ulnar side of the hand. 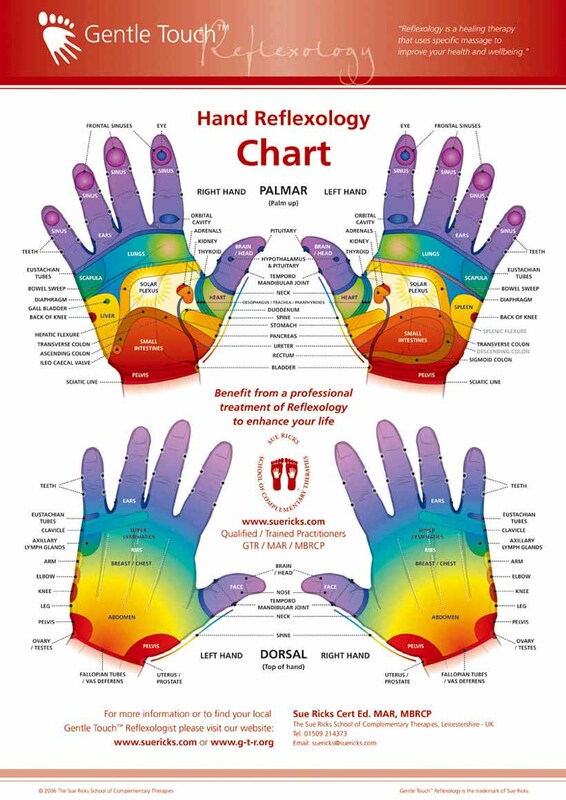 The full interactive hand reflexology chart is available at: www.handreflexologycharts.com. Hand reflexology: the radial located thumb corresponds with the spine; ulnar hand corresponds with the (externalized) limbs + ears.